The idea for CNN’s hologram technology first hatched ten years ago in the head of David Bowman at CNN, says Shalom Nachshon of Vizrt, the company that, teamed with Stats, made the effect a reality a decade later. “Back then, the technology didn’t exist,” said Nachshon. 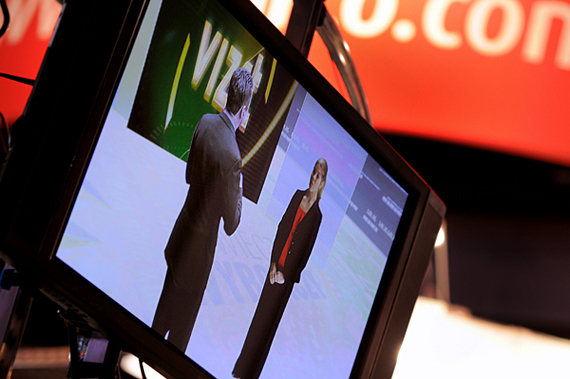 However, as CNN began prepping for the 2008 election coverage, the idea resurfaced and the research and development team at Vizrt believed they could successfully create the look Bowman envisioned. Already familiar with Stats’ technical capabilities, Vizrt integrated technology from both companies to create the final CNN hologram effect. Though the hologram technology is available in full HD, CNN opted to add some noise to the picture in order to add a “Star Trek” look to it that also reinforced the fact that the reporter wasn’t physically in the New York stuido.